The Ottoman state began as one of many small Turkish states that emerged in Asia Minor during the breakdown of the empire of the Seljuk Turks. 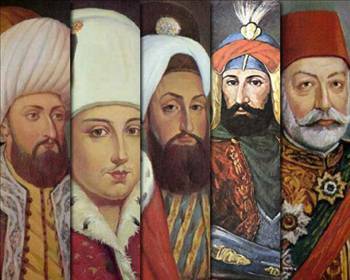 The Ottoman Turks began to absorb the other states, and during the reign (1451–81) of Fatih Mehmed II (Muhammad II) they ended all other local Turkish dynasties. The early phase of Ottoman expansion took place under Osman I, Orkhan, Murad I, and Beyazid I at the expense of the Byzantine Empire, Bulgaria, and Serbia. Bursa fell in 1326 and Adrianople (the modern Edirne) in 1361; each in turn became the capital of the empire. The great Ottoman victories of Kosovo (1389) and Nikopol (1396) placed large parts of the Balkan Peninsula under Ottoman rule and awakened Europe to the Ottoman danger. The Ottoman siege of Constantinople was lifted at the appearance of Timur, who defeated and captured Beyazid in 1402. The Ottomans, however, soon rallied. The empire, reunited by Mehmed I (Muhammad I), expanded victoriously under Mehmed’s successors Murad II and Fatih Mehmed II (Muhammad II). The victory (1444) at Varna over a crusading army led by Ladislaus III of Poland was followed in 1453 by the capture of Constantinople. Within a century the Ottomans had changed from a nomadic horde to the heirs of the most ancient surviving empire of Europe. Their success was due partly to the weakness and disunity of their adversaries, partly to their excellent and far superior military organization. Their army comprised numerous Christians—not only conscripts, who were organized as the corps of Janissaries, but also volunteers. Turkish expansion reached its peak in the 16th cent. under Selim I and Sulayman I (Sulayman the Magnificent). The Hungarian defeat (1526) at Mohács prepared the way for the capture (1541) of Buda and the absorption of the major part of Hungary by the Ottoman Empire; Transylvania became a tributary principality, as did Walachia and Moldavia. The Asian borders of the empire were pushed deep into Persia and Arabia. Selim I defeated the Mamluks of Egypt and Syria, took Cairo in 1517, and assumed the succession to the caliphate. Algiers was taken in 1518, and Mediterranean commerce was threatened by corsairs, such as Barbarossa, who sailed under Turkish auspices. Most of the Venetian and other Latin possessions in Greece also fell to the sultans. During the reign of Sulayman I began (1535) the traditional friendship between France and Turkey, directed against Hapsburg Austria and Spain. Sulayman reorganized the Turkish judicial system, and his reign saw the flowering of Turkish literature, art, and architecture. In practice the prerogatives of the sultan were limited by the spirit of Muslim canonical law (sharia), and he usually shared his authority with the chief preserver (sheyhülislam) of the sharia and with the grand vizier (chief executive officer). In the progressive decay that followed Sulayman’s death, the clergy (ulema) and the Janissaries gained power and exercised a profound, corrupting influence. The first serious blow by Europe to the empire was the naval defeat of Lepanto (1571; inflicted on the fleet of Selim II by the Spanish and Venetians under John of Austria. However, Murad IV in the 17th cent. temporarily restored Turkish military prestige by his victory (1638) over Persia. Crete was conquered from Venice, and in 1683 a huge Turkish army under Grand Vizier Kara Mustafa surrounded Vienna. The relief of Vienna by John III of Poland and the subsequent campaigns of Charles V of Lorraine, Louis of Baden, and Eugene of Savoy ended in negotiations in 1699 which cost Turkey Hungary and other territories. The breakup of the state gained impetus with the Russo-Turkish Wars in the 18th cent. Egypt was only temporarily lost to Napoleon’s army, but the Greek War of Independence and its sequels, the Russo-Turkish War of 1828–29 and the war with Muhammad Ali of Egypt resulted in the loss of Greece and Egypt, the protectorate of Russia over Moldavia and Walachia, and the semi-independence of Serbia. Drastic reforms were introduced in the late 18th and early 19th cent. by Selim III and Mahmud II, but they came too late. By the 19th cent. Turkey was known as the Sick Man of Europe. Through a series of treaties of capitulation from the 16th to the 18th cent. the Ottoman Empire gradually lost its economic independence. Although Turkey was theoretically among the victors in the Crimean War, it emerged from the war economically exhausted. The Congress of Paris (1856) recognized the independence and integrity of the Ottoman Empire, but this event marked the confirmation of the empire’s dependency rather than of its rights as a European power. The rebellion (1875) of Bosnia and Herzegovina precipitated the Russo-Turkish War of 1877–78, in which Turkey was defeated despite its surprisingly vigorous stand. Romania (i.e., Walachia and Moldavia), Serbia, and Montenegro were declared fully independent, and Bosnia and Herzegovina passed under Austrian administration. Bulgaria, made a virtually independent principality, annexed (1885) Eastern Rumelia with impunity. Sultan Abd al-Majid, who in 1839 issued a decree containing an important body of civil reforms, was followed (1861) by Abd al-Aziz, whose reign witnessed the rise of the liberal party. Its leader, Midhat Pasha, succeeded in deposing (1876) Abd al-Aziz. Abd al-Hamid II acceded (1876) after the brief reign of Murad V. A liberal constitution was framed by Midhat, and the first Turkish parliament opened in 1877, but the sultan soon dismissed it and began a rule of personal despotism. The Armenian massacres of the late 19th cent. turned world public opinion against Turkey. Abd al-Hamid was victorious in the Greco-Turkish war of 1897, but Crete, which had been the issue, was ultimately gained by Greece. In 1908 the Young Turk movement, a reformist and strongly nationalist group, with many adherents in the army, forced the restoration of the constitution of 1876, and in 1909 the parliament deposed the sultan and put Muhammad V on the throne. In the two successive Balkan Wars (1912–13), Turkey lost nearly its entire territory in Europe to Bulgaria, Serbia, Greece, and newly independent Albania. The nationalism of the Young Turks, whose leader Enver Pasha gained virtual dictatorial power by a coup in 1913, antagonized the remaining minorities in the empire. The outbreak of World War I found Turkey lined up with the Central Powers. Although Turkish troops succeeded against the Allies in the Gallipoli campaign (1915), Arabia rose against Turkish rule, and British forces occupied (1917) Baghdad and Jerusalem. In 1918, Turkish resistance collapsed in Asia and Europe. An armistice was concluded in October, and the Ottoman Empire came to an end. The Treaty of Sèvres confirmed its dissolution. With the victory of the Turkish nationalists, who had refused to accept the peace terms and overthrew the sultan in 1922, modern Turkey’s history began.